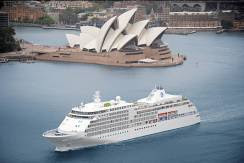 This November, why not take the trip of a lifetime with Silversea Cruises' epic 31 day voyage from Dubai to Sydney via Singapore. Covering 16 ports in seven countries, from bustling Arabian souqs and seductive Indian cities to the powder white beaches of South East Asia and Australia's Great Barrier Reef, this fascinating cruise is aimed at the true travel enthusiast. Alternatively, guests looking for a shorter voyage can choose the 15 day Dubai to Singapore sector or the 16 day journey from Singapore to Sydney. Departing Dubai on 18 November 2009, the ultra-luxury, all-suite Silver Whisper will call at Fujairah on the UAE's scenic East coast; vibrant Mumbai in the Indian state of Maharashtra; Mormugao in the former Portuguese enclave of Goa; Cochin in the south-west Indian state of Kerala; the popular Thai beach destination of Phuket; Penang and Kuala Lumpur (Port Kelang) in Malaysia, and the thriving island state of Singapore. The second sector of the voyage takes in one of Indonesia's oldest cities, Semarang on Java's north coast, followed by Darwin in Australia's Northern Territory; Cairns, Townsville and the Whitsunday Islands, with many opportunities to explore the Great Barrier Reef and Queensland's laid-back capital Brisbane, arriving in Sydney in time for the festive season on 19 December. All-inclusive, cruise-only fares for the full 31 day voyage start from just US$11,379* per person, double occupancy. Alternatively, fares for the 15 day Dubai to Singapore sector start from US$5,697* or US$6,847* for the 16 day Singapore to Sydney voyage. Silversea's generous fare includes luxury cruising to exciting ports; all-suite accommodation; gourmet meals; complimentary wines, Champagne and spirits, and all gratuities. To complement the voyage and at extra cost, Silversea guests can experience a three-night pre-cruise In the Footsteps of the Pharaohs Land Programme departing from Dubai to see the treasures of Egypt, from the Great Pyramids of Giza and the sphinx to Cairo's Museum of Antiquities and the buzzing Khan El-Khalili Bazaar. Guests can also choose from a selection of three night Silver Sights stays at luxury hotels such as Atlantis, The Palm in Dubai; The Ritz Carlton Millenia in Singapore, and The Four Seasons Hotel in Sydney. * Subject to availability, terms and conditions.